Yes, I know, you were expecting a picture of Mrs. Peel in her Queen of Sin getup. Instead, here’s a picture of every man in Christendom upon seeing Mrs. Peel in her Queen of Sin getup. Enjoy! Then we get to the “do what thou wilt being the whole of the law” ethos of the Hellfire Club and their incredibly bawdy parties, with drinking and “wenching.” They worship evil and women exist only as vessels for (sexual) pleasure. Writer Brian Clemens was pushing an envelope here. There simply weren’t enough weeks in the calendar for ABC to show all 26 episodes from season four before they went all-color in the first week of September of 1966, so some of them weren’t going to be shown. “A Touch of Brimstone” was allegedly rejected on content grounds, and, that content spoken of in whispers, it immediately made the rounds of bootleg film prints. 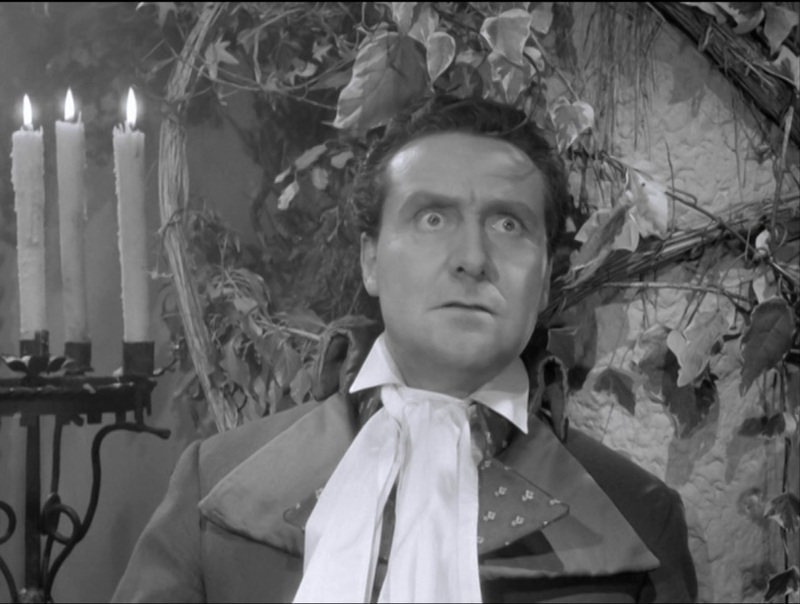 Some independent stations around the country bought the black and white package for local broadcasts, and some are said to have edited out most of the whipping scene. In short order, this episode became quite notorious. When I was a video trader in the mid-to-late eighties, you would occasionally see this one in lists and catalogs with notations like RARE AND UNCUT!! Our son didn’t understand this much at all, mercifully. It started with the great promise of bad guys who use exploding cigars, sneezing powder, whoopie cushions, and collapsing chairs, and then deteriorated into a lot of dumb men yelling and spilling their ale while smooching women in old-fashioned clothes. At least we can agree that Patrick Macnee, Jeremy Young, and their stunt doubles had a completely amazing swordfight. I’m not sure that Young even had a double. Colin Jeavons and Robert Cawdron are also in this one. Along with Wyngarde and Cleveland, it’s a great cast for a terrific episode: ABC’s audience in 1966 may or may not have been scandalized, but they definitely missed out.